Davie Village (also Davie District or simply Davie Street) is a neighbourhood in the West End of Vancouver, British Columbia, Canada. It is the home of the city's gay subculture, and, as such, is often considered a gay village. It is centred on Davie Street and roughly includes the area between Burrard and Jervis streets. Along Davie Street are a variety of shops, restaurants, services, and hotels catering to a variety of customers, as well as private residences. Davie Village is also home to the offices of Xtra! West, a biweekly LGBT newspaper, Qmunity (formerly the Gay and Lesbian Centre) which provides a variety of services for the city's lesbian, gay, bisexual, and transgender residents, and the Vancouver Pride Society, which puts on the annual Pride Parade and Festival. The business with the most notoriety is Little Sister's Book and Art Emporium ("Little Sister's"), a gay and lesbian bookstore, because of its ongoing legal battles with Canada Customs. 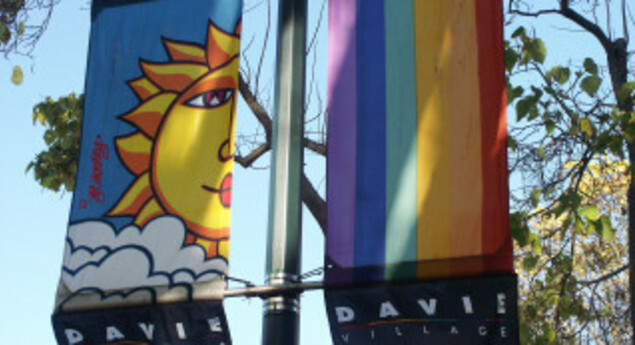 The Village hosts a variety of events during the year, including the Davie Street Pride Festival which runs in conjunction with Vancouver's annual Gay Pride Parade, during which sections of the street are closed to motor traffic. Davie Day is also held each year in early September, to celebrate local businesses and the community itself. This Day is designed to build awareness and promote the surrounding businesses, and is focused around Jervis to Burrard Street. Text Credit: Site description from Wikipedia, used under a Creative Commons Attribution-ShareAlike License. My best friend and I are always at the pride parade! This summer was our fifth year! Vancouvers first annual Pride Parade which was originally meant as a protest for more LGBT rights was in what year?